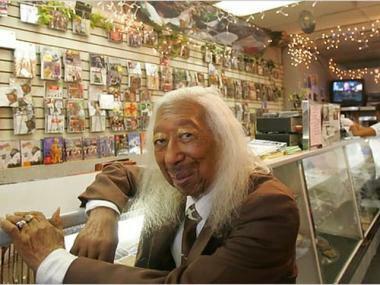 Bobby Robinson in his Harlem store. HARLEM — Harlem music legend Bobby Robinson, whose record shop was 125th Street's first African American owned business, died on Friday. The owner of Bobby's Happy House, who was responsible for several number one hits, was 93. He had been ill for several years, reported the Daily News. He had owned Bobby's Happy House from 1946 until it was forced to close in 2008. Robinson recorded hundreds of artists including Gladys Knight and Pips, Grandmaster Flash and the Furious Five, the News reported. His Red Robin, Whirlin' Disc, Fire, Fury and Enjoy labels became legendary in the music business. He later became one of the first label owners to promote rap music, with artists including Doug E. Fresh and Spoonie Gee recording on his labels, according to the News. He had to close the business when his landlord decided to raze it for new development. "I've seen 125th Street at its best and worst, and I'll tell you, there's no more exciting place in the world," Robinson told the News in a 2007 interview.